A Turkish court ordered on Wednesday U.S. pastor Andrew Brunson, who is being tried on terrorism and spying charges, to remain in detention, rejecting his lawyer's plea for release. The judge said the next hearing in the trial would be on October 12. Brunson, a Christian pastor from North Carolina who has lived in Turkey for more than two decades, was indicted on charges of helping the Gülenist Terror Group (FETÖ), which Ankara blames for the failed 2016 coup, as well as supporting the PKK terrorists organization. Speaking to reporters in western Izmir province after the ruling, U.S. Charge d'Affaires in Ankara Philip Kosnett said he was disappointed in the results of the hearing, and said the U.S. government remained deeply concerned about his status. 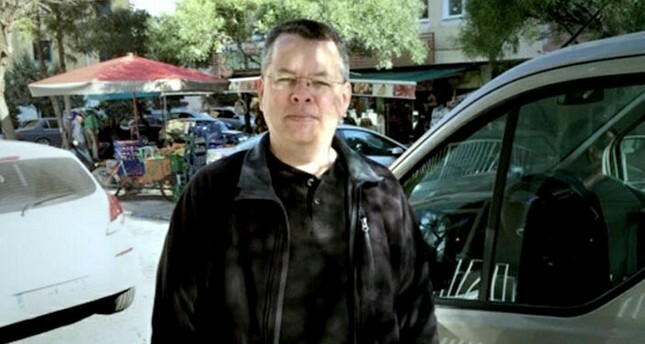 Underlining that the U.S. has "great respect both for Turkey's traditional law as a haven for people of all faiths and for Turkey's legal traditions," as well as "faith in the commitment of the Turkish people to justice," Kosnett said they will continue to follow Brunson's case closely, expressing hope that he is reunited soon with his family. Later on Wednesday, U.S. President Donald Trump urged President Recep Tayyip Erdoğan on Twitter to free the American pastor held in Turkey. "@RT_Erdogan should do something to free this wonderful Christian husband & father. He has done nothing wrong, and his family needs him!" Trump tweeted. Brunson's case was among issues Trump and Erdoğan discussed by telephone earlier this week. The case of Brunson, who was a pastor at the Diriliş (Resurrection) Protestant Church in Izmir, has been a thorny issue between Ankara and Washington. Washington has repeatedly called for the release of Brunson, claiming he was "unjustly detained." Brunson was arrested after a secret witness in a criminal probe into FETÖ testified against him while authorities were preparing to deport Brunson and his wife Norine Lyn for "involvement in actions threatening national security." The FETÖ's coup attempt in 2016 was quelled thanks to a strong public resistance. Thousands of people, from military officers who opened fire on unarmed crowds rallying against the coup to "civilian" point men of the terrorist group, were arrested or detained under a state of emergency.